As IT decision-makers look to ensure data integrity and availability in the face of rapidly evolving threats—like ransomware and a dizzying array of unmanaged endpoints—decisions on data protection architectures become more central to the overall objective. Transitioning from fragmented data protection point products to a modern, web-scale architecture can help organizations achieve that goal—like with hyper-converged data protection. 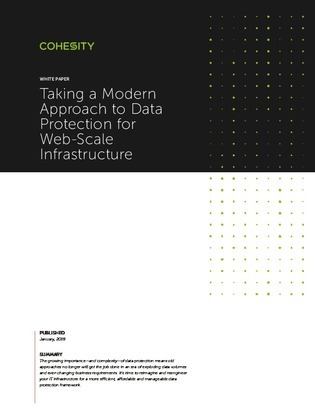 This paper examines how the hyper-converged model makes data protection more manageable, reliable, and affordable than legacy approaches. Read on for an overview of one solution—Cohesity DataProtect—and a rundown of 10 of its most critical data protection features.